A moment of celebration quickly turned into a moment of terror for a mum and daughter less than a year ago - but now they may have made history. In September last year, Amelia Naylor, then 10, was running in an after school cross country race. She was first over the finish line, but she did not have long for celebration. Soon after winning she collapsed and went into sudden cardiac arrest. Her mum Jo, 47, from Anstey, was taken over by shock but quickly sprung into action to save her daughter's life. "It was the longest 24 minutes of my life," Jo said. "I went into total auto mode, I don't think my thought process will ever be the same, I think I used up all my brain power. It was completely shocking. "She came first in the race. One of the girls in her group was struggling a bit so she slowed down with her. "She is normally a sprinter not a cross country runner. I have always told her 'be second and when you approach the finish line sprint to the end. "She got overtaken when she was helping her friend and I think she pushed herself to get to the finish line. "She was moaning after because she had given it all she had got and she said she felt sick. I didn't think much of that because she's felt sick after races before, then she was sick. "Then she started rolling around in it, I told her that there was a whole field to roll around in, she didn't need to roll around in her own vomit, but she was saying 'mummy I can't breathe'. "Then she became unconscious. I thought she was messing me around. I was trying to check her conscious levels but when I didn't get a response I gave her some rescue breaths but she didn't pick up, I shouted for her teacher and he called for an ambulance." Jo continued working to resuscitate her daughter, while someone was sent to the village to grab a defibrillator. She said: "I looked for a pulse and couldn't find one so I had to start chest compressions." Jo added: "If I had to go to the other schools, if I had to pick up her sister I wouldn't have been there to watch the race, just to pick her up. "I don't doubt that her teachers would have helped but they would have had lots of students to look after and it would have been a bit of time before they noticed and every minute counts." Christine Lethbridge, headteacher at Swithland St Leonard’s CofE School , stepped in to help Jo and to thank her the mum nominated Mrs Lethbridge in last year's Leicester Mercury education awards. When the defibrillator arrived, Amelia just needed one shock to resuscitate her. Then, the air ambulance arrived and put a breathing tube in for Amelia before they were taken to Leicester Royal Infirmary by land ambulance. Jo, who is a sister in neonatal at Leicester Royal Infirmary, said: "I was insistent we were going to the Royal. I rang my consultant at work and by the time we got there he had got a bed for her. "I wanted to be near Glenfield, because I knew it was a heart issue. She stayed there for two days. "She was fruit loop at that point, post sedation. She said we weren't her parents, that we were the wrong colour. My husband was really upset by that, I hoped I knew what that was." 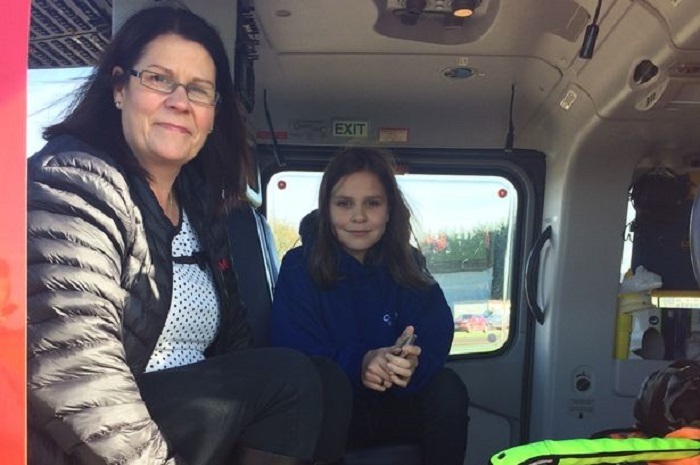 Amelia spent four weeks at Glenfield hospital where she had her 11th birthday. Tests discovered her left coronary artery was connected in the wrong place. Three surgeons then operated on her to correct the problem. Jo said: "She was asymptomatic. There was nothing at all to say there was an issue. "Now she is tip top, you wouldn't know the difference. "It feels fantastic to see where she is now, it is unbelievable. Every time I look at her I feel so blessed. It's such a miracle. "She was back at school around a month later and she recently in the past couple of weeks has been able to do PE again. "We have tried to be really positive about everything because the risk of depression after this sort of thing is quite high. "It's always been about how lucky we are and how lucky she is, she is allowed to talk about it, she is allowed to be upset." Amelia is now back at school taking part in her last ever primary school sports day - far from the terrifying moment less than a year ago that could have changed her life forever. Amelia recently joined more than 100 people in Essex to break a Guinness World Record for the largest gathering of cardiac arrest survivors. Along with other survivors, including Ingrid Gardner from Oakham, Rutland who collapsed in the street after a funeral in Milton Keynes, Amelia took part in the world record attempt on Saturday, June 9. Support group Sudden Cardiac Arrest UK organised the event which took place at Basildon Hospital in Essex. Jo added: "It was very well organised. We knew there would be another boy at a similar age who had his cardiac arrest a bit younger, but Amelia was the youngest there on the day. "It was great to meet other people who had rescued their partner or child and I think it was quite good to see that Amelia is now the only one who is a survivor. Everyone in the room felt lucky." Jo had a session on using defibrillators with her running club and says it helped her with Amelia. She said: "That training kept me going until the AED arrived, because I knew I couldn't stop until that got there. It got me through that 20 minutes." Jo was invited to talk at a similar event for Leicester University's running club to tell her and Amelia's story. It was at that event she found out about the world record attempt. "One of the cardiologists who was teaching, told me about the survivors group on Facebook and so I signed up to the group and found out about the attempt." she said. "At the time Amelia was number 23 but on the day there were 127." Guinness told the organisers they needed 50 people to break the world record but they are still waiting for confirmation. Both Jo and her daughter are now trying to campaign to make sure people know what to do if someone goes into cardiac arrest. Jo added: "You cannot really do anything wrong. You cannot be any deader than dead. If you call 999 then the call handler will remind you what to do. "It's about recognising the signs, calling 999 and then doing what they tell you to. "You cannot really make it any worse, anything is better than nothing. "I know I certainly didn't do it perfectly for Amelia but she has no damage."